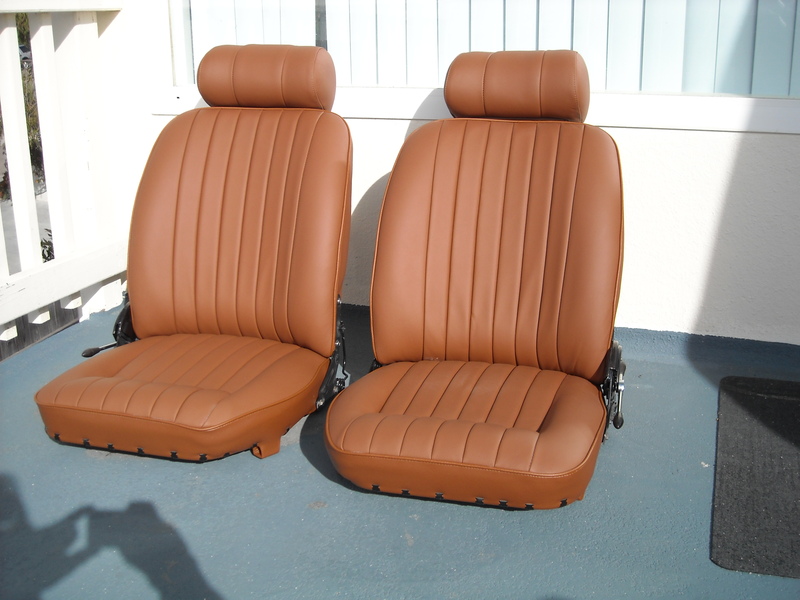 As I have pointed out in previous posts, I did not upholster my seats. Indeed, I did take a swing at it but was frustrated at the results. Since I was working in central California at the time, I dropped everything off at XKs Unlimited, where they did a very nice job of it. 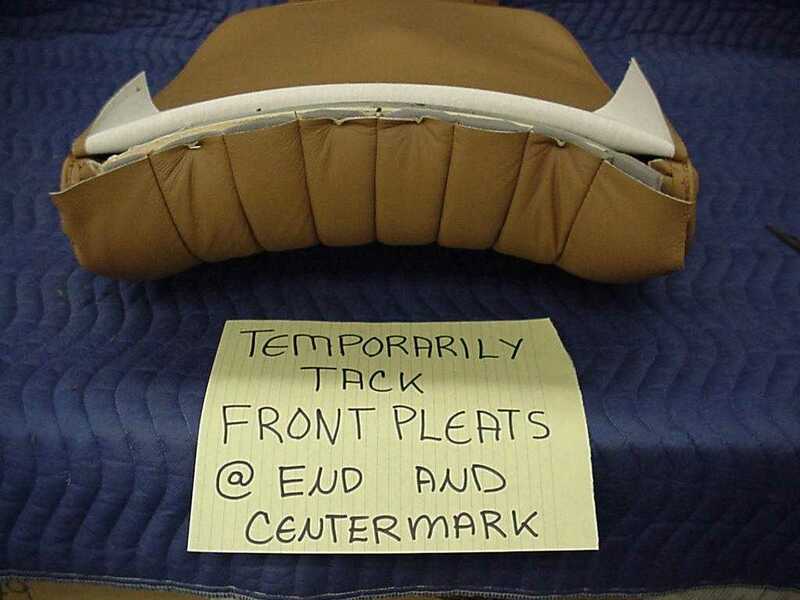 That said, there are folks you are interested in trying to upholster their seats. My seats were taken from a Series 3 car, which gives you the ability to recline the seat back and a headrest. Following are a series of photographs that I received from BAS that illustrate some of the highlights of the process. As with any upholstery work, the devil is in the details. 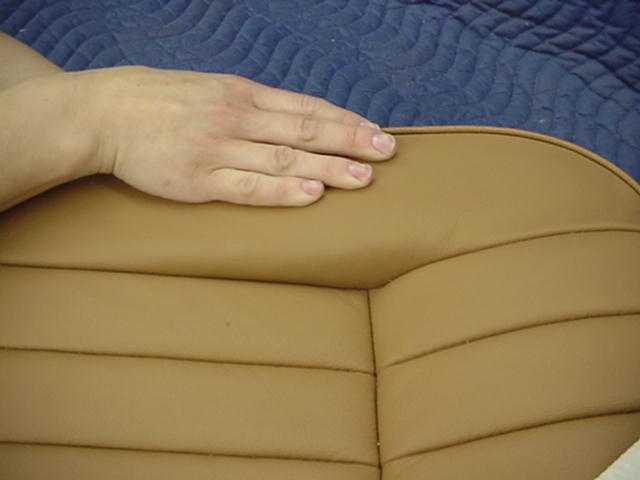 In particular, any flaw in the foam padding under the seat coverings tends to telegraph and show up as a pucker or misfit of the material. So although it doesn’t really show in the attached photos, forming your foam just right is very important. Of course, the following assumes that the covers are pre-sewn to a high standard, which my BAS covers were. So here goes. 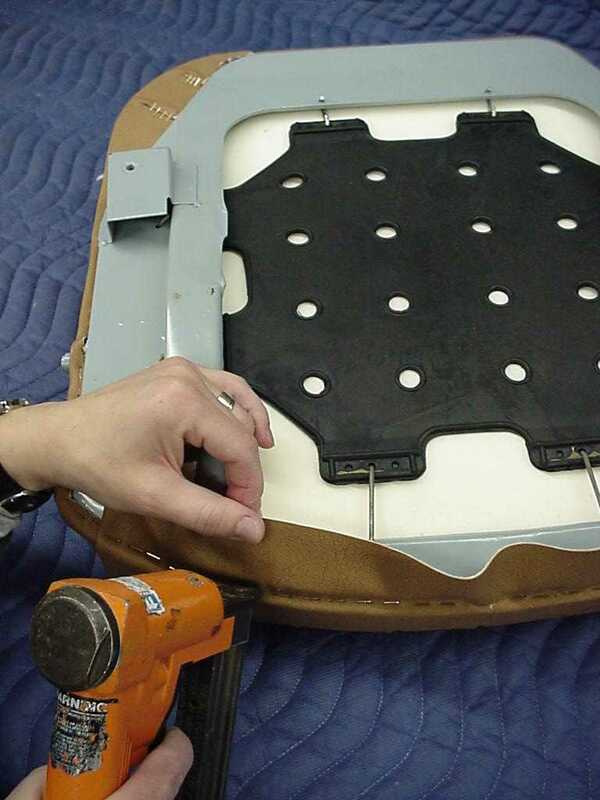 This shows the glue pattern on the foam and the mating upholstery for the seat bottom. 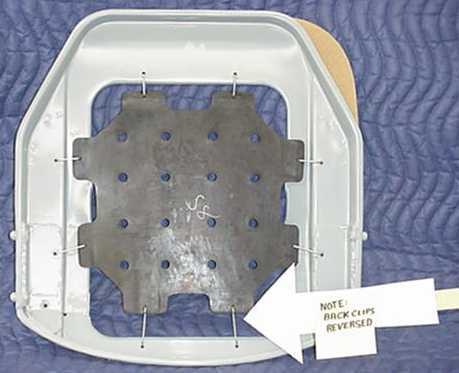 Since the seat bottom is in a shallow depression, the glue serves to hold it down. This can also be done with some strategically placed heavy threads tied to the diaphragm. 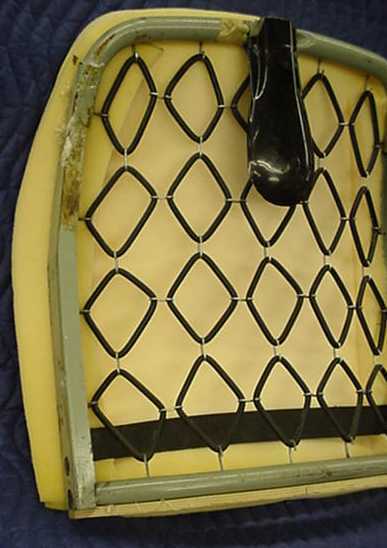 Then you get to pull the skirt taught and staple it to the wood tack strips strategically placed around the base of the seat frame. That was easy, right? 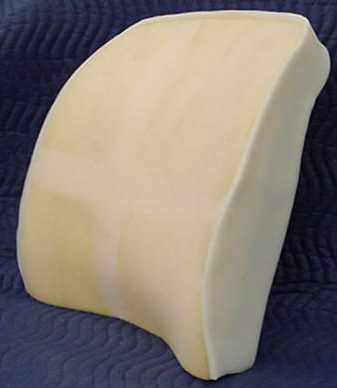 Now we can move on to the backrest. 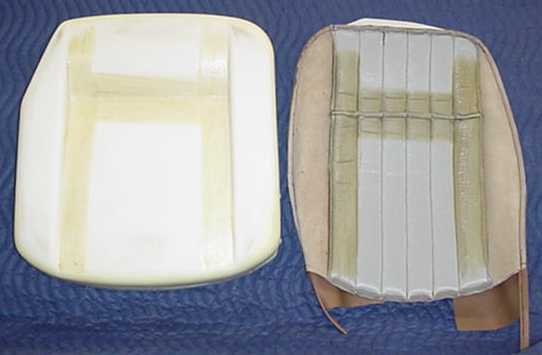 Here is a shot of the seat back, with the rubber suspension and part of the foam padding installed. You can buy new suspension. Here is the seat back with the foam completely installed. Here is a neat little trick. 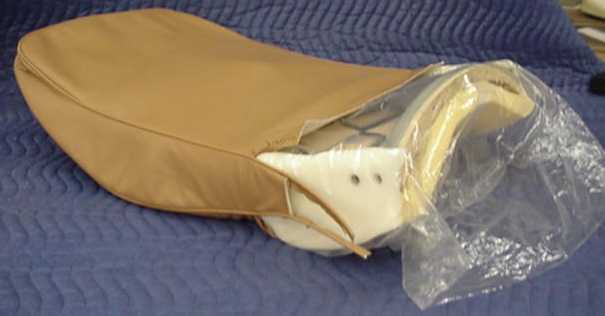 You put a plastic bag over the foam, since normally the foam grabs terribly at the upholstery fabric. Once you get everything in position, you can tear the bag and pull it out. 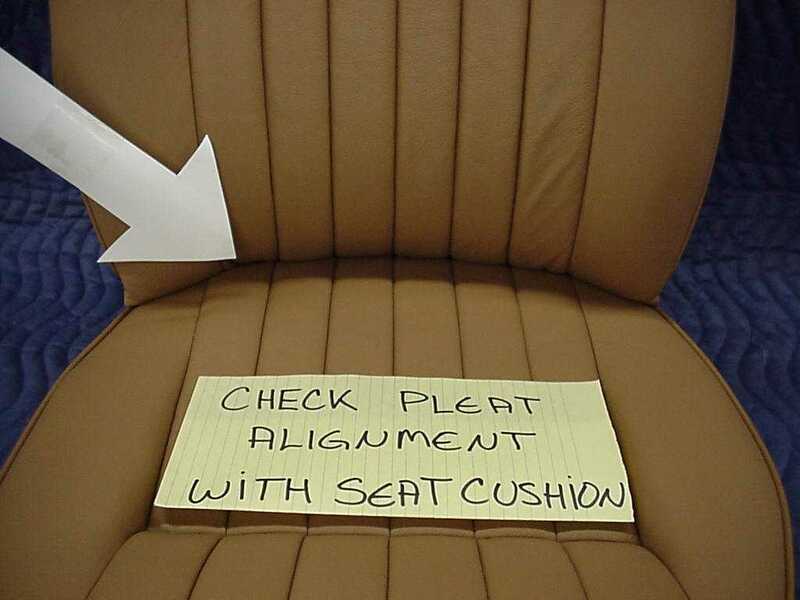 As far as I can tell, there is no gluing involved for the seat back. 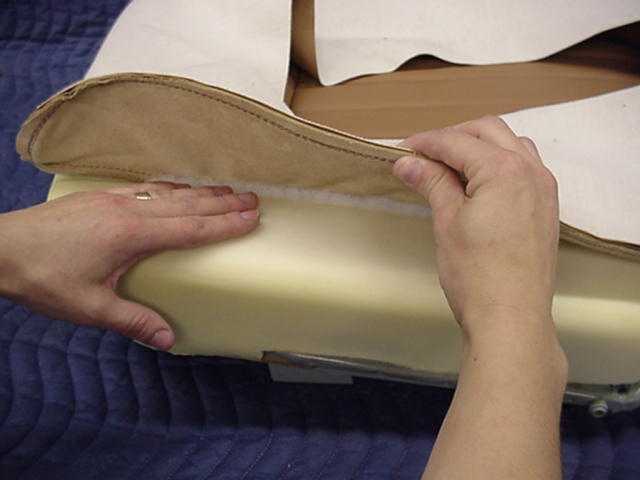 You are going to eventually staple the bottom edge down securely but first you attach it provisionally, attach the seat back to the seat bottom, and check for alignment of the seams. 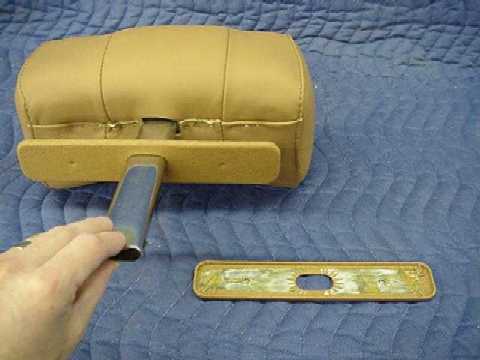 After all of the above work, applying upholstery to the headrest is a quick job. Attach all the hardware and you are done!